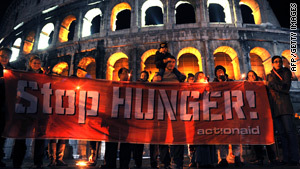 Anti-hunger campaigners demonstrate at the Colosseum in Rome on Sunday ahead of the world food security summit. Ban Ki-moon: "Small-holder farmers are the heart and soul of ... poverty reduction"
Rome, Italy (CNN) -- Somewhere in the world, a child dies of hunger every five seconds -- even though the planet has more than enough food for all. "Today, more than 1 billion people are hungry," he told the assembled leaders. Six million children die of hunger every year -- 17,000 every day, he said. The summit opened with the leaders adopting a declaration to renew their commitment to eradicating hunger. They promised to do so by promoting investment, reversing the decline in funding for agriculture and tackling the effect of global warming on food security. Urgent action is critical, Ban said. In 2050, the world will need to feed 2 billion more mouths -- 9.1 billion in all. The steps Ban proposed included providing farmers with seeds and land and offering them access to better markets and fairer trade. "These small-holder farmers are the heart and soul of food security and poverty reduction," he said. "Our job is not just to feed the hungry but to empower the hungry to feed themselves." The summit came under criticism even before it began, with some aid groups skeptical that it would accomplish much. The United Nations hopes that donors will go beyond affirming their support to end hunger and fulfill a promise they made during a Group of Eight meeting in July to increase food aid significantly. Though more than 60 world leaders are at the summit, all but one of the G-8 leaders were absent. Italian Prime Minister Silvio Belusconi is hosting the gathering. The United States sent the head of the U.S. Agency for International Development, and Britain sent two ministers. During his speech, Ban also tied the global warming crisis to hunger eradication. The melting of Himalayan glaciers will affect the livelihood of 300 million people in China and up to 1 billion throughout Asia, he said. And African farmers might see harvests drop by 50 percent by 2020. The United Nations has scheduled a climate summit next month in Copenhagen, Denmark. "There can be no food security without climate security," Ban said. "They must produce results. "The world is impatient for us to make a difference. I, too, am impatient. And I am committed." The United Nations also seeks commitment from the public, making an online appeal for individual donations to fight hunger. The U.N. World Food Program's "Billion for a Billion" campaign aims to reach 1 billion individuals. "If a billion Internet users donate a dollar or a euro a week, we can literally transform the lives of a billion hungry people across the world," said Josette Sheeran, the World Food Program's executive director. Small donations can make a big difference, Sheeran said. "Year in, year out, governments have supported WFP in its mission to feed the world's hungriest people, but they cannot be expected to do it alone," Sheeran said. "It's time for members of the public to act."